Hurricane Florence is predicted to make landfall near the Brunswick Nuclear Generating Station power plant located on the southern coast of North Carolina. 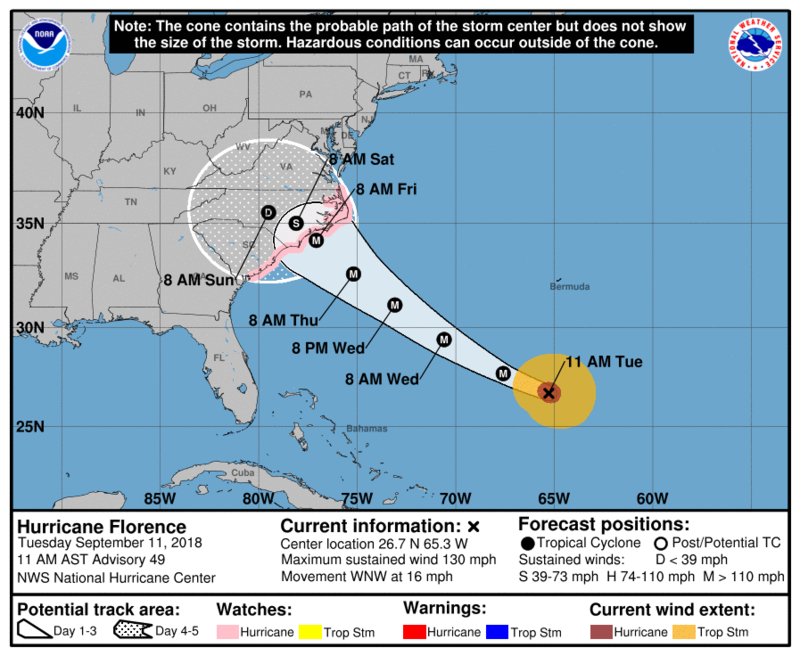 The U.S. National Hurricane Center, in its 11 a.m. update on Sept. 11, is forecasting that Florence, a Category 4 storm with 130 mph winds, could make landfall north of the border of North Carolina and South Carolina on Friday morning, Sept. 14. The European Centre for Medium-Range Weather Forecasts in its latest forecast for Hurricane Florence is predicting a deluge of rain over the area. In one area near the nuclear plant close to the southern North Carolina coast, more than 40 inches of rain is forecast to fall. AccuWeather is predicting “catastrophic” flooding in the area. The Weather Channel is also predicting “heavy rain,” and it noted that the storm surge was already slamming Cape Hatteras and Cape Fear on Sept. 11. The NHC issued advisories on Sept. 11 for Florence, the Carolinas, and Virginia. A storm surge watch is in effect for Edisto Beach in South Carolina to the North Carolina-Virginia border, said the NHC. Albemarle and Pamlico Sounds, including the Neuse and Pamlico Rivers, also received storm surge watches. A hurricane watch is in effect for Edisto Beach South Carolina to the North Carolina-Virginia border and the Albemarle and Pamlico Sounds, the agency said. “Interests elsewhere in the southeastern and mid-Atlantic states should monitor the progress of Florence. Additional watches may be required later today,” the NHC said. “Class I” buildings at the Brunswick Power Plant “are designed to withstand 300-mph tornado winds,” according to a 2004 report from the U.S. Nuclear Regulatory Commission (pdf). “The nominal plant grade results in 2 feet of water depth surrounding the plant during maximum surge conditions, and all of the safety-related structures are waterproofed to an elevation of 22 feet,” the report said. According to the NRC report: “During the approach of Hurricanes Charley and Frances to the Cape Fear Region of North Carolina (which includes the Brunswick power plant), the NRC resident inspectors attended hurricane preparation status meetings, reviewed site preparations for adverse weather, and reviewed preparations for plant damage assessment. The inspectors toured risk-significant and susceptible plant areas to verify the implementation of adverse weather preparation procedures and compensatory measures before the onset of adverse weather conditions.” It’s unclear if power plant officials are doing the same ahead of Florence’s approach. World Nuclear News in 2016 reported that regional nuclear power plants were left unscathed by Hurricane Matthew, including the Brunswick power plant. Category 5 Matthew, which caused $15 billion in damage, hit Caribbean countries before slamming Florida, and it later moved up the coast, hitting South Carolina as a Category 1 hurricane before weakening. “All the nuclear power plants affected by Hurricane Matthew weathered the storm well and were well-prepared for the high winds and heavy rains,” Joe Pollock, the U.S. Nuclear Energy Institute vice president of nuclear operations, told World Nuclear News in October 2016 after Matthews impact. “These facilities have proven their ability to withstand hurricanes and provide electricity to homes and businesses as soon as off-site power is restored and the electricity grid can accommodate the power,” he added.